Emerging after World War II, Mid-Century Modern design could be found in architecture and interiors, each milieu reflecting the vintage flair for which this style is known. Bringing modernism into America’s post-war suburbs was the hallmark of this time period. After the economic effects of the 1930’s depression and then the war, designers focused on creating affordable, well-designed home furnishings and sought to reconcile craftsmanship with mass production. Clean, sleek lines with an emphasis on form and function were the innovations spurred on by new, modern materials and new technologies developed during the war. The set design on AMC’s Mad Men is the perfect example of the Mid-Century Modern trend. 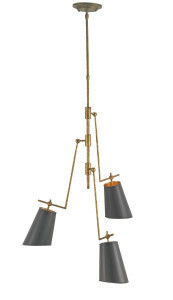 At the April Market, Currey & Company will introduce new lighting and furniture with a mid-20th century style. The Jean-Louis Chandelier is timeless and functional. Wrought iron and sheet metal form this classic task light. Shades are hand-finished with Marbella Black while the interior of the shade exudes a warm reflection from the Contemporary Gold Leaf. The clean lines and 1950’s mod silhouette of the Harvick Table Lamp is grounded with a polished concrete cone base and a Black Shantung shade. 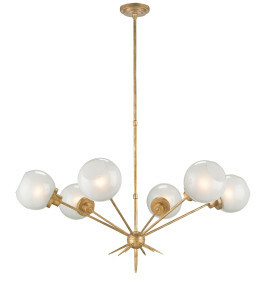 Featuring a Washed Gold Leaf finish, the Shelly Chandelier is chic and contemporary. Its airy frame maintains a refined look while the six globe-style lights provide ample lighting. 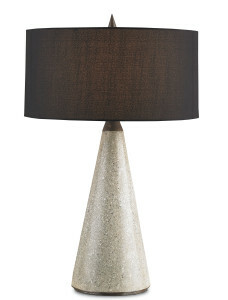 This beauty is the perfect element to bring sophistication to a Mid-Century Modern milieu. This entry was posted in Currey & Company, Market, Products and tagged black, Chandeliers, Gold, Gray, Lighting, Mid-Century, Modern, Table Lamp on April 7, 2014 by Currey & Company.